Not all women’s leather jackets feature the same traditional style. While you can find them in classic styles, such as “bomber” jackets, there are dozens of non-traditional styles from which to choose. If you’re a fashion-conscious woman and want to take your outfits to the next level, you should think outside the box when choosing a leather jacket. By exploring some of the following non-traditional styles, you’ll create a more unique style while differentiating yourself from the mainstream crowd in the process. What is a cropped leather jacket? It’s just like any other cropped shirt or top, with the only exception being that it’s a leather jacket. Cropped leather jackets are defined by their shorter, cropped height. Most leather jackets, including men’s as well as women’s, stop at or near the waistline when worn. Cropped leather jackets differ in the sense that they stop your midsection when worn. As a result, they allow you to project more color in your outfit by revealing the shirt or top underneath jacket. Another non-traditional stye in which women’s leather jackets are made is hooded. Hooded leather jackets are defined by the presence of a hood. The hood itself usually isn’t made of leather. Instead, it’s made of a traditional fabric that’s attached to the jacket. The great thing about wearing a hooded leather jacket is that it will protect it from rain, sleet and snow. If your outside and the sky begins to fall, you can cover your head with the hood to stay dry and comfortable. Of course, hooded leather jackets are also stylish, featuring a unique appearance that’s not found in traditional, non-hooded leather jackets. For these reasons, you can’t go wrong with a hooded leather jacket. You can even find sleeveless women’s leather jackets are available. Also known as a leather vest, a sleeveless leather jacket offers the perfect combination of aesthetics and comfort. During the spring and summer, many women stop wearing their leather jacket because it’s too hot. While leather jackets are warm and comfortable to wear during the fall and winter, they are often too hot to wear during the spring and summer. A sleeveless leather jacket solves this problem by leaving your arms exposed. Regardless of the summer heat, you can comfortably wear a sleeveless leather jacket. Leather jackets usually feature a single color, such as black or brown. When they were first invented over a century ago, leather jackets were designed strictly in a single color. After all those years, single-colored leather jackets are still the most popular. With that said, you can find women’s leather jackets available in multiple colors. Two-tone leather jackets are characterized by the presence of not one but two different colors. A typical two-tone leather jacket, for instance, may feature a primary color as well as one or more stripes in a secondary color. When choosing a two-tone leather jacket, make sure the colors match each other. If you’re ordering a custom two-tone leather jacket — meaning you can choose the colors — don’t choose colors that clash with each other. A two-tone leather jacket with black and brown won’t work because these two colors clash when used together. Instead, you must choose colors that naturally flow together, such as black and white or brown and gold. Women’s leather jackets are available in a variety of lengths. We’ve already discussed cropped leather jackets, which have a shorter length than standard leather jackets. But there are also women’s leather jackets with a longer length. Known as a leather long coat, it’s a great choice to wear if you are trying to create a formal or semi-formal appearance. With their longer length, leather long coats have a naturally elegant and sophisticated style, thereby making them more formal than standard-length leather jackets. Some women’s leather jackets are designed with ruffles for an added level of aesthetics. 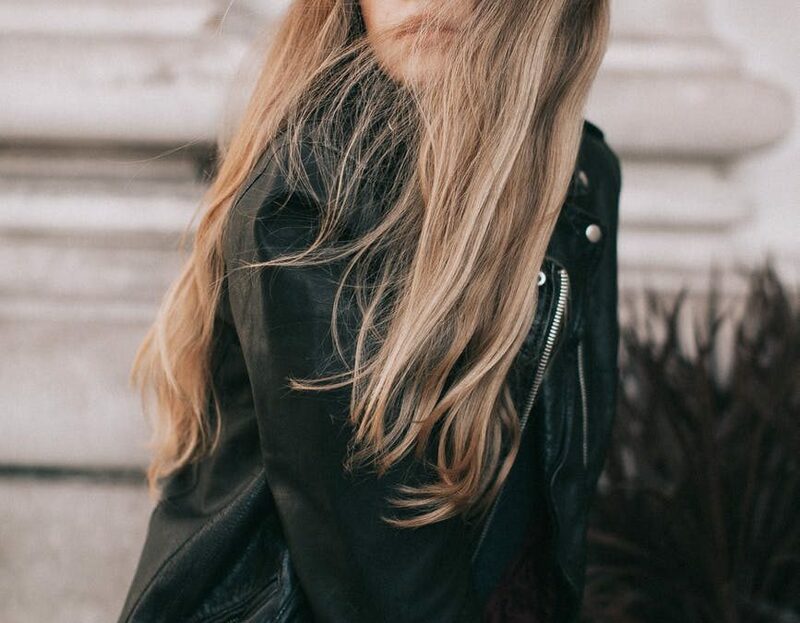 For example, you can purchase a ruffled women’s leather jacket here at LeatherCult, which features a beautifully ruffled section of fabric around the bottom. It’s a fun style that’s becoming increasingly popular among fashion-conscious women. What is a double-breasted leather jacket exactly? Double-breasted leather jackets, like suit coats and jackets, have a wider section of fabric overlapping the front. Double-breasted leather jackets are considered slightly more formal than standard leather jackets. And because they feature a wider section of overlapping fabric, they are also warmer to wear, making them an excellent choice for the fall and winter months. Of course, you can still wear a double-breasted leather jacket during the warmer months, but the added insulation it provides makes it ideal for the cooler months of the year. Make sure it fits. If your leather jacket is too big or small, it may be uncomfortable to wear and look awkward when you do wear it. Choose a jacket made of genuine leather. Faux leather jackets, while they look similar, lack the attractive qualities and characteristics of genuine leather. Pay attention to the fasteners. Some women’s leather jackets have one or two rows of buttons on the front, whereas others have a zipper. Check the care label. Usually found inside the collar, the care label contains instructions created by the jacket’s manufacturer on how to clean and care for it. Choose a jacket that matches your current clothes. Go through your wardrobe to see what other clothes you own and choose a leather jacket to match them.